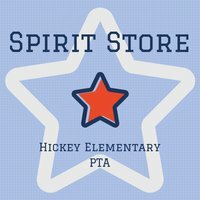 Join us during the students’ lunch hour as we open the Spirit Store! Volunteers are needed every other Friday from 10:30am to around 1pm. The Hickey Spirit Store is held by PTA during school lunches on several Fridays each month throughout the school year. The PTA sells a fun variety of affordable items, including (but not limited to) erasers, pencils, rulers, wallets, gel pens, notebooks, magnetic locker mirrors and more. Prices range from $0.05-$5.00 per item.